I'm Vince, a stick figure who draws a lot of stuff and puts it on the internet! I like a lot of movies, books, and video games, which have been great sources of inspiration for me. I do not like onions. 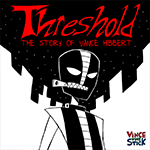 Threshold is about Vance Hibbert, an ordinary dude living an ordinary life. One night, he is visited by a mysterious stranger that has the power to grant wishes. Influenced by his love for comic books, Vance wishes to have superpowers of his own. Layout testing and landfill for extra images.